Not only did junior guard Katie Benzan hit the 1000 point mark on Saturday night, she contributed 22 points on the night to lead the Crimson. 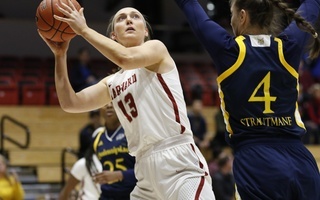 On a night where the Crimson won its fifth consecutive game and its second straight against Dartmouth, the star of the show was none other than junior sharpshooter Katie Benzan. Leading the team with 22 points tonight, Benzan became just the 20th player in Harvard women’s basketball history to score 1000 career points. The Wellesley, Mass. native came into Saturday night’s contest against the Big Green sitting at 991 career points, needing just three of her signature triples to convert to reach that mark. It took no more than two quarters for Benzan to do so, knocking down one from deep in the first stanza before converting on three more in the second quarter. 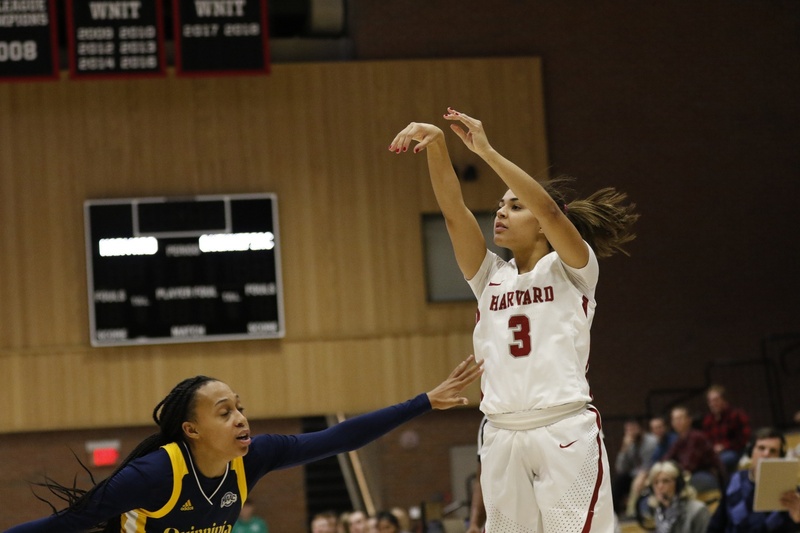 Similar to her first two years donning the crimson, Benzan has been an indispensable offensive staple for coach Kathy Delaney-Smith’s roster this season. She leads the team with just under 15 points a game and has shot 37 percent from beyond the arc on almost 10 attempts a game. Benzan has been relentless in her effort on both ends of the court this season. She also leads the team with 1.7 steals per game averaging a team-high 35.3 minutes per game in 15 contests. Benzan played an integral role in the Crimson’s 73-57 victory tonight giving them the offensive spark they needed in order to seize momentum on the road. 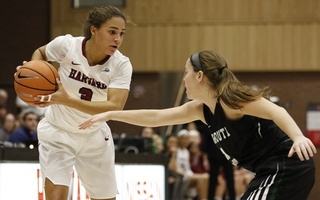 Her shooting touch was on display early as Harvard started its scoring with a steal at half court that led to a deep triple by Benzan. The play was symbolic of the the team’s ability to capitalize on defensive plays and its strong shooting. With a win on the road tonight, the Crimson continued their winning streak and currently sit at the top of the Ivy League. By beating Dartmouth both home and away, Harvard has shown its potential as a legit contender for the Ivy League title even with Penn and Princeton awaiting in mid-February. Benzan, as much as any player on the team, believes in the Crimson’s prospects to avenge its semifinal loss from last year and take home the chip. Harvard will have four more road games to play before returning to the comfortable confines of Lavietes Pavilion. Next weekend, the Crimson will travel south on the I-95 with contests at Yale and Brown and look to get one step closer to Ivy League glory. — Staff writer Mahtab Shihab can be reached at mahtab.shihab@thecrimson.com. Cambridge lawyer Dennis A. Benzan declared his candidacy this week for the Mass. Senate seat vacated by recently imprisoned Anthony D. Galluccio. The Cambridge City Council considered and passed two policy orders designed to benefit the city’s least advantaged residents at their meeting Monday night. One proposed a Cambridge-wide job fair and another explored the possibility of introducing free internet access across the city. ​While Joey Colton took home athlete of the week honors this week after leading men’s water polo to its first NCAA Tournament berth, four other Harvard student-athletes had notable performances for their respective teams, earning this week’s Athlete of the Week runners-up honors.